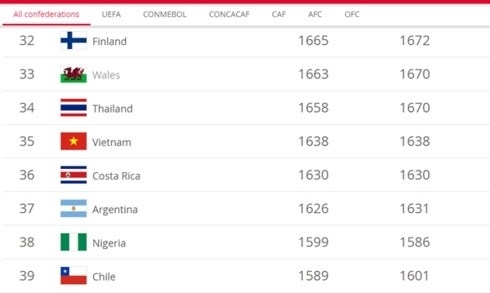 AsemconnectVietnam - The Vietnamese women’s national football team has retained their 35th position in the latest FIFA world rankings. Vietnam are currently ranked seventh in Asia, one spot below regional rivals Thailand, who are ranked 34th in the world. Australia sit at the top of Asian rankings with the world’s No 6 position, followed by Japan (7), the Democratic People’s Republic of Korea (11), the Republic of Korea (14) and China (16). In the overall world rankings, the US remained first with Germany second and Britain third. The rankings are set to change in the second quarter as the 2020 AFC Women’s Olympic Qualifying Tournament is scheduled to take place this month.